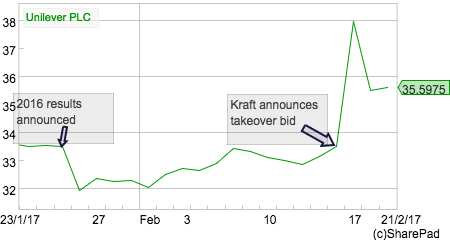 Last week’s bid by US food company Kraft-Heinz for Unilever caught many investors by surprise. But in retrospect maybe it shouldn’t have. The bid came in response to the difficulties that many large consumer goods companies are facing right now. It also tells investors a great deal about the quality of these companies and how valuable they might be. Big consumer goods companies such as Kraft and Unilever have been struggling to grow. The main reason for this is because they are already very big. The companies cite reasons such as competition, low economic growth and falling prices but in reality they are struggling because of their immense size. It is very hard for something that is already big to become proportionally much bigger. This is as true for companies as it is for trees. The famous investor Jim Slater summed this up brilliantly by saying that “elephants don’t gallop” when explaining his preference for investing in smaller companies. If big companies cannot produce significant increases in sales then they begin to start looking at cutting their costs in order to grow their profits. One of the best ways to cut costs is to buy a rival company and strip out duplicate costs. This has essentially been Kraft’s corporate strategy in recent years. Kraft-Heinz was created in July 2015 when Heinz with the backing of 3G Capital and Warren Buffett bought Kraft and merged it with it existing operations. 3G Capital has built up a reputation for buying food and drinks companies that are struggling to grow and then slashing costs in order to grow profits. A look at Kraft-Heinz’s 2016 results showed that 3G’s strategy was bearing fruit. Turnover fell by 3.5% to $26.5bn but trading profits (EBIT) increased by 35% to $6.1bn with EBIT margins increasing from 16.5% to 23.2%. The effect on net income and EPS was even bigger due to lower interest costs on debt and the paying off of preferred equity – adjusted EPS increased by 52% from $2.19 to $3.33. Buffett likes to invest in consumer brands due to their very predictable earnings streams which are driven by regular ongoing purchases by consumers. Over the long run these types of company have seen significant increases in value as well as a growing stream of dividend payments. The Heinz deal has worked reasonably well for him so far as investors have bought into the cost-cutting strategy and the attractions of consumer goods companies in general. Kraft-Heinz has been struggling to grow sales as its food brands contain a lot of unhealthy processed products which consumers are shying away from. Cutting costs has been the only way to grow profits. The trouble with cost cutting is that you eventually run out of costs to cut – unless you can find another company to buy. This is where Unilever fitted in. Unilever is one of the world’s biggest consumer goods companies. It has a portfolio of well known food brands such as Marmite, Hellmann’s, Ben & Jerry’s and Knorr. However, most of its sales (58% in 2016) come from homecare and personal care products such as Surf, Domestos, Cif, Comfort, Dove, TRESemmé and Rexona. In terms of turnover it is much bigger than Kraft-Heinz and has much lower profit margins. This is probably the main attraction of Unilever to Kraft-Heinz. With a bigger cost base to attack it could probably see the scope to make very big cost savings. The other attraction is that Unilever is a much higher quality business as evidenced by its much higher ROCE. Kraft-Heinz’s is nothing to shout about at all. Unilever has had a high and stable ROCE for some time now – the kind of business that Warren Buffett loves to own. Then there is Unilever’s geographic presence. Nearly 60% of sales are made in emerging markets where long-term growth rates are arguably much better than developed western markets. In stark contrast, Kraft-Heinz makes 70% of its sales in the USA. Last, but not least is the attraction of Unilever’s strong financial position. Its net debt to EBITDA ratio is only 1.4 times. Kraft-Heinz finances look more like a utility company with net debt to EBITDA of 4.6 times. It could have used Unilever’s financial strength to add more debt in order to magnify the returns from cutting costs. Like Kraft, Unilever has hit a bit of a rough patch recently. Its 2016 full year results were reasonable enough with 3.7% underlying sales growth and a modest improvement in operating margins but there was a marked slowdown during the last three months of 2016. In both its developed and emerging markets, Unilever sold fewer products than the year before and in Europe had to charge less for them as well. The company is also having problems in the key emerging markets of Brazil and India. Unsurprisingly, Unilever’s share price fell following this announcement. Investors and media commentators questioned whether the company was in trouble. This was an opportune time for Kraft to pounce. Kraft’s offer amounted to a total of £126.8m for Unilever’s assets (its enterprise value or EV) which equated to a trailing PE ratio of 26.6 times based on 2016 diluted EPS. On an EBIT yield (EBIT/EV) basis it was 5.17% as shown in the table below. These are high valuations in most people’s eyes. In fact, there are plenty of investors out there who believed that the share price of Unilever and other consumer goods shares were overvalued before Kraft’s bid. They sell products which customers use and purchase regularly. This gives them a highly stable and predictable revenue stream. This is why businesses such as Unilever have been referred to as “bond proxies” as their income streams tend to be stable just like a bond’s. In fact, they have tended to grow, unlike a bond’s. The strength of the consumer brands acts as a barrier to competition which allows Unilever to achieve and maintain high returns on capital employed (ROCE). They do not require large amounts of extra capital investment in order to grow their profits. This allows them to produce lots of free cash flow and to pay a growing stream of dividends to their shareholders. These characteristics make these businesses lower risk investments. So why does Unilever think that the bid undervalued its business? 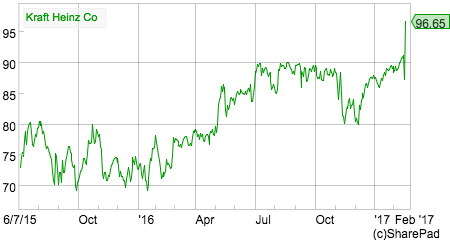 The takeover premium was too low – 18% is quite low if you want to secure the support of a target company’s shareholders. 30-40% is more common. Was Kraft really trying to get Unilever on the cheap or was the premium small because Unilever shares were already highly priced? Other consumer goods companies are more highly priced. On an EBIT yield basis – which expresses a company’s trading profit or EBIT as a percentage of its current enterprise value – Unilever looks a lot cheaper (it has a higher yield) than most of its peer group. That doesn’t necessary mean that Unilever is cheap in absolute terms but on a relative basis it is, especially when you take into account its impressive ROCE. Recent acquisitions have been for higher valuations. 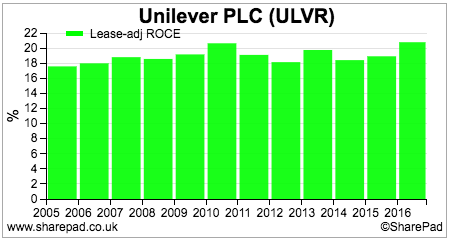 For example, Reckitt Benckiser is paying over 30 times historic EPS for baby food company Mead Johnson. Kraft’s offer undervalues the long-term growth potential of Unilever. By this, I mean that Unilever might be able to grow its future profits, cash flows and dividends so that its shares are worth substantially more than £39.50 to long-term investors. In this respect, the company has history on its side as it has been able to do this in the past despite its shares being highly valued. (This has been brilliantly argued in a recent article (PDF) by James Bullock of fund managers Lindsell Train). But will Unilever be able to deliver decent rates of profits growth? Now that Kraft has walked away from bidding for Unilever, its management are now under great pressure to prove that the company is worth more than Kraft offered for it. This will not be easy. Put simply, the company has to increase its growth rate. It is currently cutting some costs and improving its operating margins as well as having the benefit from recent acquisitions such as Dollar Shave Club. However, this might not be enough to achieve a higher growth rate. One option is to sell some of its underperforming food products such as its Flora and Bertolli spreads or PG Tips tea. Another option is to merge with another or part of a consumer goods company such as Colgate Palmolive. There is no guarantee that these events will happen or be done on favourable terms for shareholders. Consumer goods shares are highly valued by the stock market. They are struggling to grow sales and profits. Acquisitions are more likely in order to address this problem. The cost-cutting potential on offer may mean that some shares might be undervalued at current prices in the event of a takeover. Management teams in the sector are under pressure to increase growth rates. Current share prices may be too high if growth rates continue to fall.